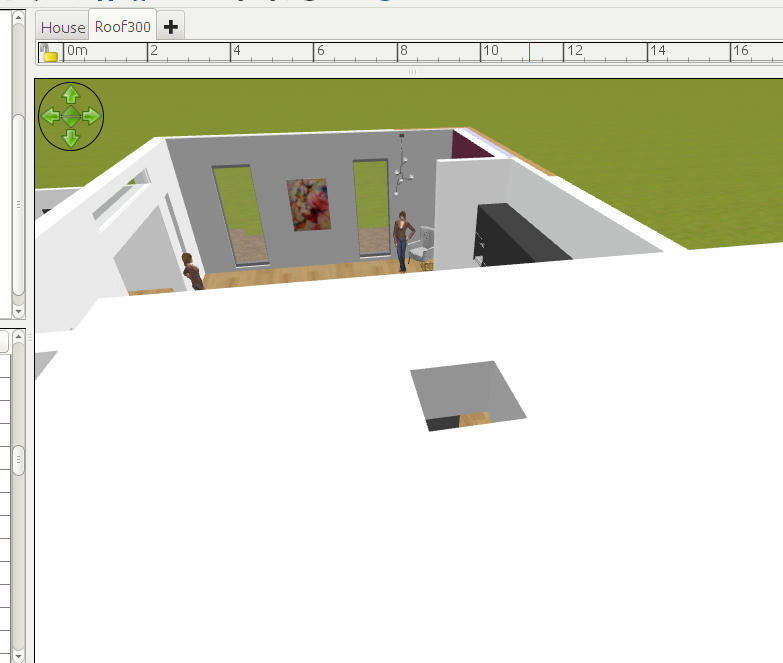 I finally found a way to create flat roofs in my model with cut-outs for skylights that I found in tune with my workflow. I thought I would create a thread and add the steps one at a time with the hope that it might eventually end up in the tips and tricks section. Other posts will follow - this is the first. For the sake of example I am only going to do one part of the roof that is why it is incomplete, the two cut outs shown are examples only. I tried the approach that uses a vertical wall, cuts a window, saves out to an OBJ file, (re)imports and during the import flips it to horizontal but this approach did not suit. in a fluid manner without having to save out OBJ files. Yesterday's roof probably will not fit tomorrows tweaked design. 2. Work in plan view so I can see how it all fits together. 3. Control colour of plaster walls of skylight cut out. Roof is dark but when I look up from inside I want to see white plaster and hopefully a blue sky, this is an important aesthetic for me. 4. Have freedom over the shape of the roof to be able to follow the contour of walls, arbitrary shape in the sense of the perimeter of the roof. 5. Be able to texture the ceilings as seen from below and to be able to make changes on the fly. The method involves use of levels with details of areas I had problems with and what the solutions were. Create a box or block - I will call this the "Skylight Tool" because it will be used to cut holes in the roof. To make the Skylight tool simply add a BOX which is in the Miscellaneous category of furniture. I made mine 50cm wide and deep and 500cm high, it can be resized later. In the second 'photo' it can be seen that I have a wood panel texture on the ceiling and the Skylight tool passes through, the ceiling does not show when viewed from above as you would expect. Select the SkyLight tool and save it out in an OBJ file. [ Menu ] 3D View -> Export to OBJ format. Make sure you export only the Skylight tool by selecting "Export Selection" when asked, check the export file was saved and then delete the original. The Skylight can now be imported back in from the OBJ file. The important step is to make sure that Skylight tool is imported with the same property as a Staircase - namely that it will cut a hole through any ceilings or floors it may pass through - see the ticked orange box in the next image. Position the Skylight tool back into the room, it will not yet cut a hole in the ceiling. 1. It will signal to Sweethome that we want the Skylight tool to cut a hole in the ceiling - Sweethome will not cut the hole if there is no upper level. 2. It will give us a place to construct the roof, actually as far as Sweethome is concerned the roof is really an upper level floor but for us its a roof. This means if your walls are 200 cm high and you want a roof that is 40 cm thick then you need to set the elevation to 240 cm, this will mean that the roof will sit on top of your 200cm walls. It may help to think of the roof not sitting on top of the level but actually hanging underneath it. I gave my level a sensible name Roof300 which indicates the height of the wall it will sit on - this is because I have different blocks in the building with different wall heights and so I need to have all roof sections at a particular height in the same level. To review, if the walls in question are 300cm high and the roof is set to 40cm thick, I need to create a level with elevation 340cm. 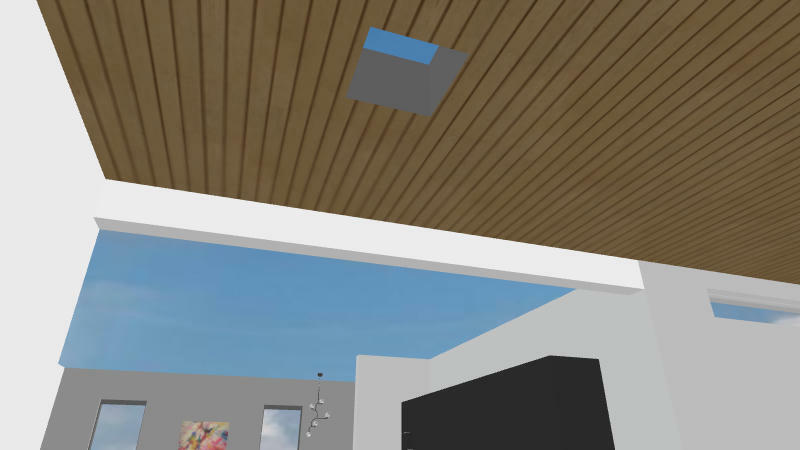 Once the Roof (level) has been added the Skylight tool can actually cut a hole in the ceiling, however we will not see a hole ( viewing from underneath ) until the Skylight tool has been made invisible since it obscures the hole it makes. [ menu ] Furniture -> Modify ( or right click ) to modify the Skylight tool. Choose materials -> modify and set all 6 faces of the skylight tool to be invisible. 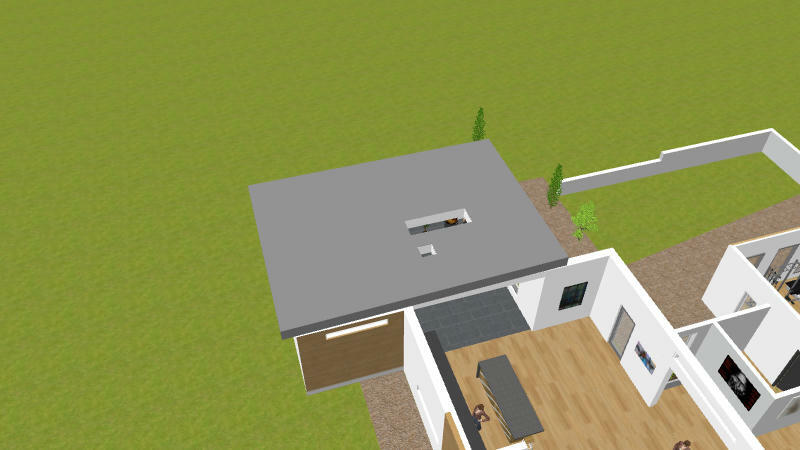 This will not work using the visible 'box' in the home furniture list as that only indicates whether the Skylight tool should be present or absent in the model. Once this has been done then when viewed from underneath the ceiling should have a hole. If this does not happen check the following. 1. Is the Skylight tool invisible? 2. Was the level added? 3. Is the Skylight tool high enough to cut the ceiling. 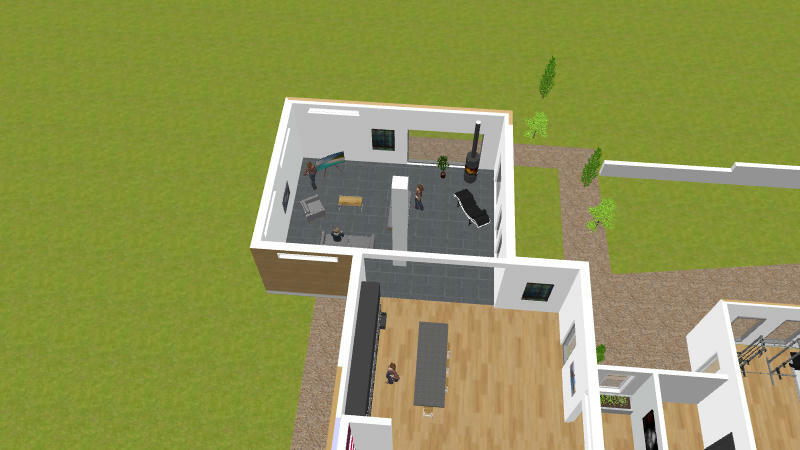 We can see the virtual visitor and also the square outline of the Skylight. 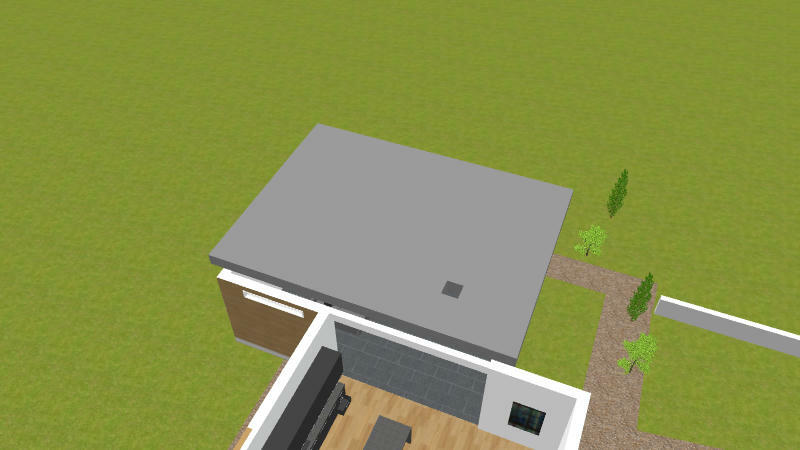 There are two levels one called house which contains pretty much everything in this single storey build, the other level called Roof300 is there for our roof which actually DreamHome thinks is a floor. To make the floor appear we need to define a room, Dreamhome already knows the elevation and thickness because those were set in the creation of the level. In my design I want a certain amount of overhang, in otherwords the roof is larger than the walls it sits on so I create a room by adding points which sits outside the perimeter of the walls. 1. Make sure that the tab for the second level in my case roof300 is selected. 2. Create a room on it by adding points, the great thing here is that we pick up all the usual alignment cues when moving the pointer around and can define pretty much any shape of perimeter for the roof. Its now possible to select the newly created roof and give it a colour. 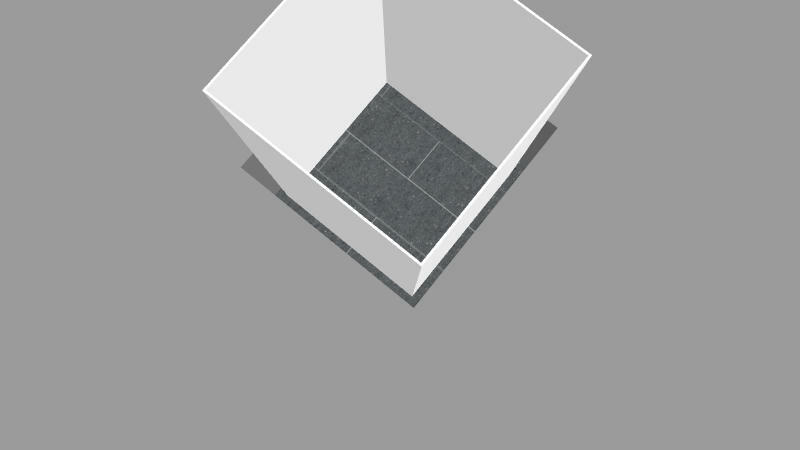 Remember - Sweethome thinks of the solid block that we call a roof as a room floor so actually we have to edit the room and change the colour for the floor. It may at this stage help to think of the room on the second level as a concrete second level floor before the walls are added. Setting the floor colour does not just set the top surface - the one you would walk on, it also sets colour on the sides and even the underneath. 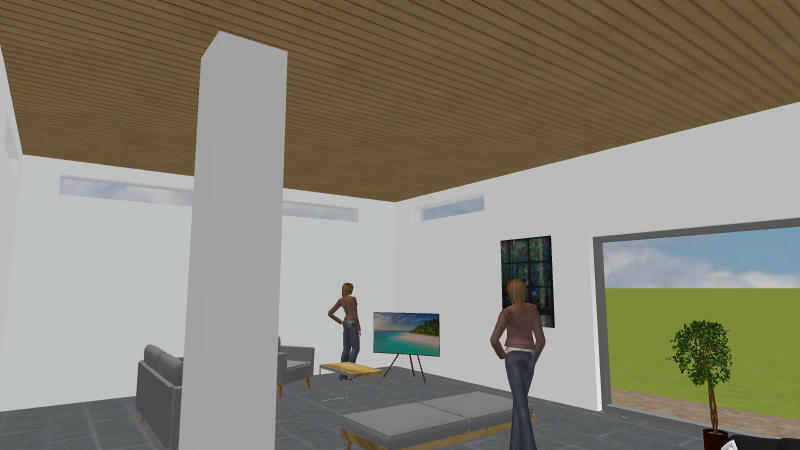 Note that the wood strip texture is still there, this is because it was defined as a texture on the ceiling of the ground floor room, the ceiling is the zero thickness sheet of colour or texture that Sweethome automatically adds (subject to options) when we are viewing from a point lower than the tops of the surounding walls. At this stage you may encounter problems with your ceiling texture not showing. If this is the case go check and edit the settings on level0 - I called mine 'Home' the one that most of your building is defined in. You may find it is necessary to lower the ceiling by say 0.1 cm so that it appears definitively beneath the solid roof that 'hangs' from level 1. The first time I tried this I did have to lower my ceiling by a tiny amount - it appears that the setting "Height" in the level determines at what height the ceiling should appear, just reduce it by a negligible amount and the ceiling should show, equally the ceiling disappears if you raise the ceiling by a small amount. Its a good idea to check the setting of height in level0 as Sweethome applies a default which may not match the wall heights. At this stage we are nearly complete, there is one remaining issue, when the skylight is viewed from below the side walls of the 'roof cut' are the same colour as the roof which may not be our preference. I will cover that last stage in the next post. In this final stage we want to have control over the colour of the inner walls of the Skylight at the moment they are the same colour as the roof. This is achieved by creating a new level which is at the same height as the one we added for the roof. I called the level created for the roof Roof300 which indicated the height of the walls on which the roof rests so I will call this new level "WhiteLiner300" - white liner refers to the fact that we will be creating four very thin white walls that line inside the Skylight hole. My apologies to non native English speakers - a liner can be a kind of inner sleeve. The idea is simple. We are going to create very thin walls on this level that will sit inside the Skylight almost like wall paper, the walls will be used to give the correct colour. The useful thing about walls created on a level is that they start not at the top surface where you would walk but on the bottom surface of the level. This means the walls we create inside the skylight will start at the same height as the ground floor ceiling. This process is not difficult but users unfamilar with having more than one level will need to get used to a few things. 1. The view you see both in aerial and visit virtual mode depends on which level you have selected. [Menu] Plan -> Make All Levels Viewable. The first of the above makes the currently selected level visible. Most people will find it necessary to use both of the above options quite a lot during this process. Its actually quite simple but does take a little co-ordination. 1. Create a new level called "WhiteLiner300" which is just a copy of "Roof300". [menu] -> Plan -> Add level at same elevation ( as selected level ). 2. 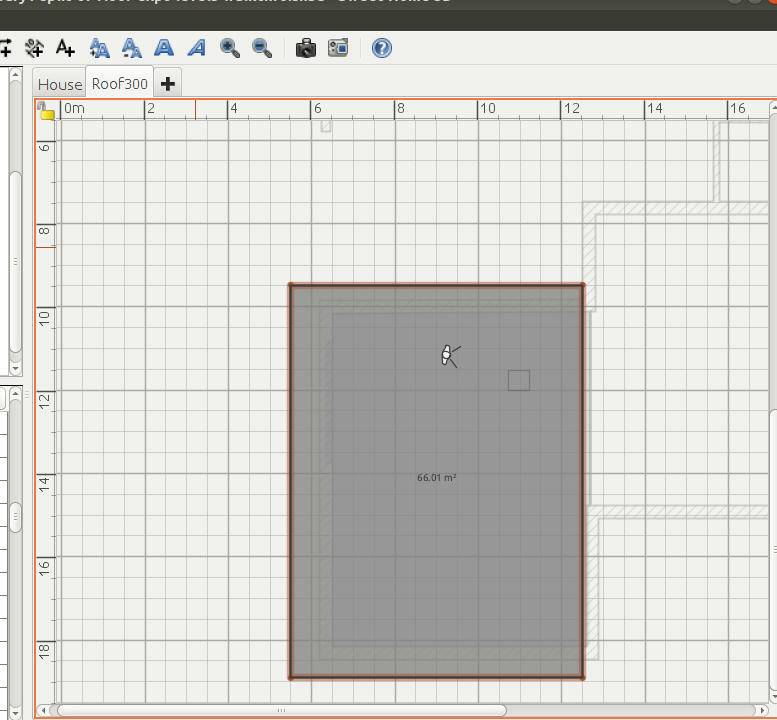 In plan view you should still see the outline of Skyline tool. 3. 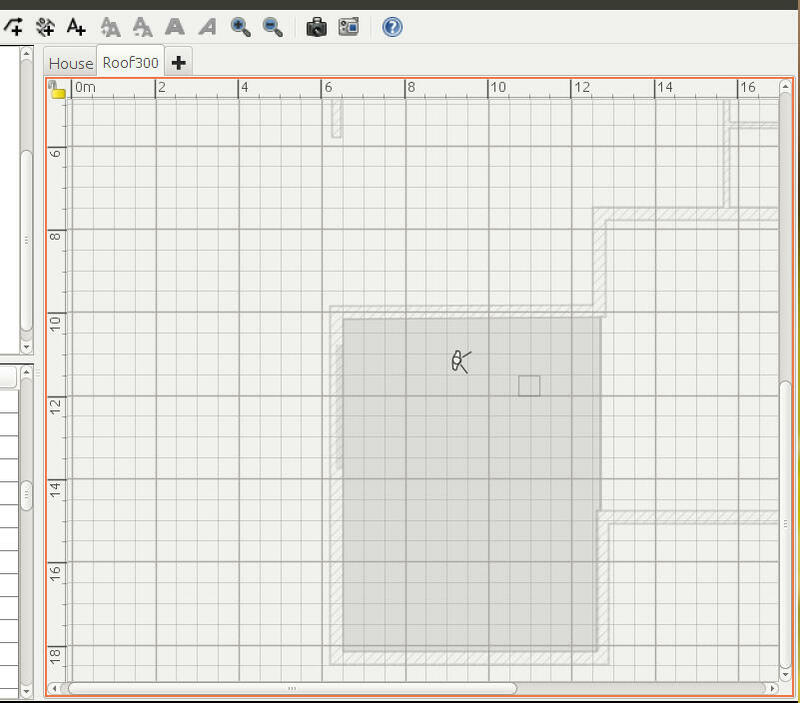 Create four walls which match the profile of Skyline tool. 5. Adjust the walls to be fairly thin - say 2 cm to begin with. 6. Zoom in and adjust the walls so that they sit inside the hole in the roof. 7. Zoom is as much as is required to fit the White liner walls so that they fit snuggly in the roof hole, reduce wall thickness to taste. I have missed out some basic skills, for instance you need to be able to create a closed loop of four walls by being able to "join" walls, to be able to colour the walls, move them around to adjust and so on. I hope the following image will help a little, I have deliberately left a big gap between liner and hole and made the White liner walls too high, I think it helps a little to see it this way. To finish off this example I would need to adjust the liner walls 'by eye judgement' and also set their correct height. If this seems like a complicated and long winded procedure it really is not that bad when do for real a few times. 1. The perimeter of the roof can be edited without needing to adjust the Skylight unless the roof edits actually affect the skylight area. 2. If the roof is slid around it can be seen that the skylight stays where it is. 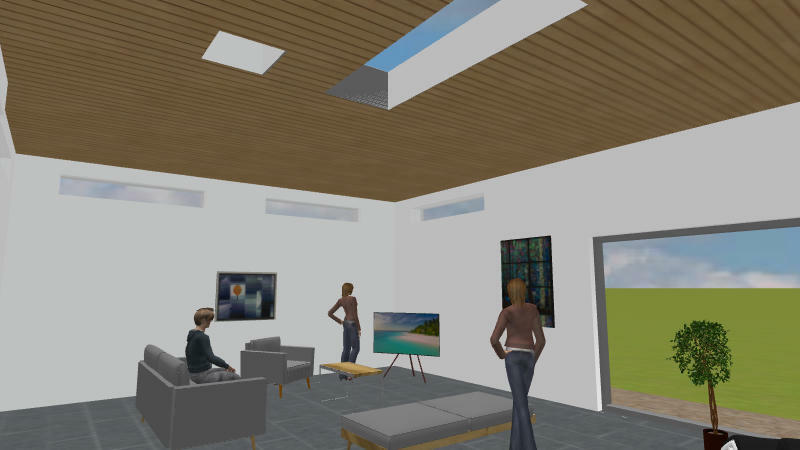 Alternatively if the roof, Skylight and Skylight liner are all selected then they can be moved as a group. 3. To change the cut dimensions of the Skylight it is only necessary to edit the Skylight tool - however the Skylight liner will not automatically resize because it has no real connection with either the Skylight hole or the Skylight tool that made it - it was created and sized purely by eye judgement so it will need similar attention again. Seriously though its not as complex as it sounds and was exactly the solution I was looking for. I can now create and tweak roofs and skylights but I will not have to "start all over again" each time I make a change to my house that affects the walls or roof. 1. Sorry I sometimes lapse into calling SweetHome DreamHome. 2. I forgot to add that the position of the Skylight can be changed by moving the skylight tool - if the Skyline liner is selected at the same time then it can be moved with the skylight. 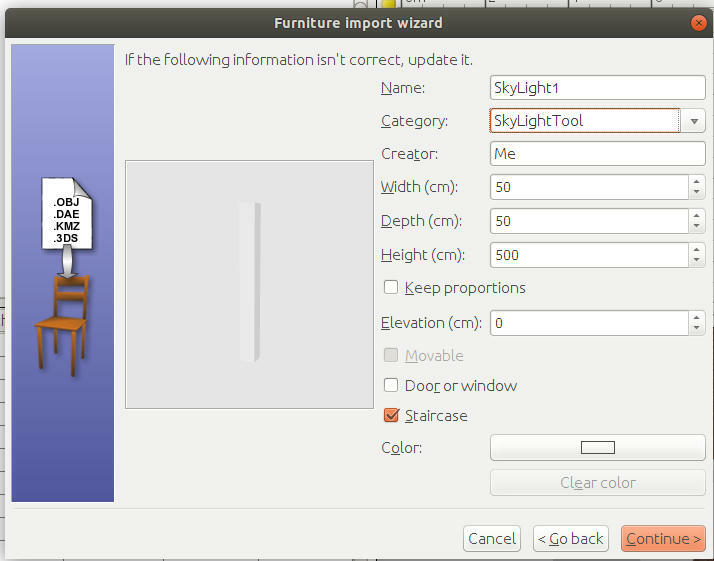 The skylight tool can be copied, resized and used elsewhere. It should be possible to add the Skylight tool with the Staircase flag activated to the furniture library so that a ready to use resizeable Skylight tool is there to use for any skylight. I am sure I will have to make some corrections to all of the above, it took a long time to write I am sure there are some mistakes. I did not explain the following bit very well....its about making the White liner for the hole in the roof. "The useful thing about walls created on a level is that they start not at the top surface where you would walk but on the bottom surface of the level." Yes that is true but what I did not mention is that even before you add any height to the wall it is already as high as the floor is thick - the wall is measured in terms of its height above the top surface of the floor. If you could have a zero height wall it would in reality be as high as the thickness of the floor. If I recall you cannot have a zero height wall so the wall can be set to a height of say 0.1 cm, this means it will start at the same level as the ceiling - pass through the entire thickness of the floor ( actually our roof ) and stick above the top surface of the floor (actually our roof ) by 0.1 cm. Just remember when setting the height of the White liner that you already get the thickness of the floor ( our roof ) for free !!! The following is completely wrong - please text search for it. "4. Adjust the walls to be the same height as the roof thickness"
No ! As mentioned above walls already get the floor thickness ( which for us means roof thickness ) for free. The walls need to be made only a nominal small height of say 0.1 cm. looks like you may have done a lot of work to achieve the already achievable. Add a hatch from standard library to project....export it... import..
That may have done for you. Also, approx 2 yrs ago one of our Russian friends shared a file in which there were about a dozen different invisible shapes, not sure how or where you would search for it, but its in the ether somewhere.